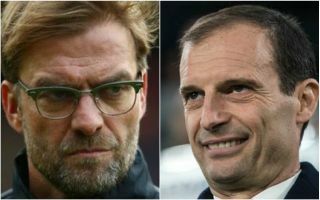 Juventus manager Massimiliano Allegri has been spotted taking a strange dig at Liverpool boss Jurgen Klopp over his lack of silverware won at Anfield. Below is a screen-grab of the Italian tactician’s likes on Twitter, which show that he seemingly approved of another Twitter user mocking the German’s achievements with Liverpool. Klopp is widely regarded as one of the best managers in the world after doing great work with the Reds, and having also won league titles at previous club Borussia Dortmund. Quite why Allegri would hold a grudge against him is a mystery to us…perhaps this was just a slip of the thumb on a dodgy smartphone screen?